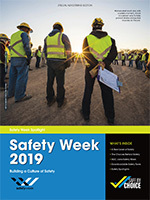 Engineering News-Record provides the engineering and construction news, analysis, commentary and data that construction industry professionals need to do their jobs more effectively. ENR reports on the top design firms, both architects and engineers, and the top construction companies as well as projects in the United States and around the world. Our products include a weekly magazine with more than 47,812 paid subscribers, a website with over 196,000 unique visitors a month and a series of in-person events. The audience includes contractors, project owners, engineers, architects, government regulators and industry suppliers—many of whom work globally. ENR connects diverse sectors of the industry with coverage that everyone needs about issues such as business management, design, construction methods, technology, safety, law, legislation, environment and labor. Front page from first issue of Engineering News as a weekly, January 1, 1876. The exhibition currently on view at the Business Information Center focuses on the history of Engineering News-Record magazine. ENR has a history that can be traced back to 1874. The publication has its roots in two separate publications, Engineer & Surveyor and The Plumber and Sanitary Engineer. Engineer & Surveyor was founded in April 1874 by George H. Frost. The journal was published monthly and consisted of sixteen pages with a small subscription base and no advertising. 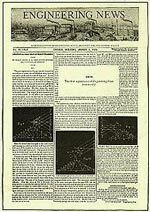 In early 1875 the journal's name was changed to Engineering News and the subscription price was reduced to $1 a year. Frost decided to move to New York in December 1878. In 1883, he sold a third interest in the journal to D. McN. Stauffer. In January 1887, another partner, Arthur Mellen Wellington, purchased a one-third interest in the journal and edited it alongside Mr. Stauffer. Wellington was the driving force behind the journal from that time on and expanded the subscription base considerably. Wellington died in 1895 and Stauffer retired in 1908. Frost repurchased Stauffer's share in the journal and had earlier repurchased Wellington's. In August 1911, realizing his advancing years, Frost sold the journal to the Hill Publishing Company. Major Henry C. Meyer, founder of The Plumber and Sanitary Engineer..
Henry C. Meyer, a manufacturer of plumbing supplies founded the publication The Plumber and Sanitary Engineer in December 1877. He established the journal to provide a forum for the discussion of the principles of sanitary engineering and public health issues. 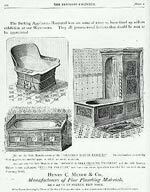 The title of the publication was changed to The Sanitary Engineer in 1880 and, on December 1st 1881, the journal switched from a monthly to a weekly publication. In 1887 the title was again changed, this time to Engineering and Building Record. By 1890 the journal formally adopted the name by which it had become widely known - Engineering Record. In 1901 Major Meyer decided that after 25 years working on the paper it was time to retire. He sold Engineering Record to James H. McGraw, who in turn transferred the property to the McGraw Publishing Company. The transfer was completed in November, 1902. Edward J. Mehren was appointed editor of Engineering Record in 1912. As a clear thinker and forceful writer Mehren made the editorial page one of the strongest features of the Engineering Record. He demanded from his associate editors not only the facts, but the facts arranged in an orderly and easily understandable manner. Advertisements from Henry C. Meyer & Co. "Bathing Appliances" taken from The Sanitary Engineer, April 1, 1881.. In 1917, following the death of John Alexander Hill, James H. McGraw merged the McGraw and the Hill Publishing Companies. With the merger of both companies the unification of the engineering journals seemed logical, but the proposal met with strong resistance. If magazines can possess personalities, then the Record was perceived as aggressive and vulgar, while the News was considered stodgy and abstruse. The staff at the Record lobbied for their publication's independence. McGraw, however, wanted to forge an alliance with the News because of its standing in the higher echelons of the profession. The first issue of Engineering News-Record was published on April 5, 1917. On January 1st, 1987 the acronym ENR was adopted as the title of the magazine.